Shoulder pain is a common issue that could occur due to various causes. More often than not, shoulder pain is a symptom of an underlying problem. Disorders of the rotator cuff – This is the most prevalent cause of shoulder pain. A rotator cuff is a group of muscles and tendons surrounding the shoulder joint that helps keep the shoulder stable. Frozen shoulder – This is a painful condition that reduces normal movement in the joint. Sometimes, this condition can result in the complete immobility of the shoulder. - Shoulder instability – In this condition, the shoulder is rather unstable and may have an abnormally long range of motion. Shoulder pain could also be caused due to a problem in areas other than the shoulder such as neck or bicep. X-ray – An X-ray of your shoulder joint will help detect any problems with the bones. Magnetic Resonance Imaging (MRI) – This test will help detect problems with soft tissues such as tendons and ligaments. Ultrasound scan – This test can also help diagnose problems with ligaments, tendons and joints. Blood tests – These tests will help identify if there is any underlying issue such as a cancerous tumour, diabetes or polymyalgia rheumatica causing the shoulder pain. To treat shoulder pain, your doctor may initially suggest some pain killers and ice packs to manage the pain and reduce the inflammation. You may also be asked to refrain from activities that aggravate your symptoms. Depending on the severity and cause of shoulder pain, other treatments may be recommended such as physiotherapy, corticosteroids injections (medication containing hormones) and in extreme cases, surgery. How can Shoulder Pain be prevented? Practice simple shoulder exercises to help strengthen and stretch your rotator cuff tendons. Use ice after exercising if you have had issues with your shoulder previously. 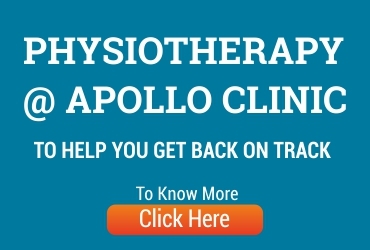 At Apollo Clinic, we understand how shoulder pain can cause a lot of discomfort and suffering as well as hamper your ability to move freely. We have a range of services provided by some of the finest medical professionals to manage shoulder pain. We are also well-equipped with cutting-edge technology and amenities to ensure that you have a smooth treatment experience.